Whether it’s the northern deserts of Trujillo or the dunes of Ica, sand boarding in Peru is ideal for a little desert thrill-seeking and the perfect complement to any Peru adventure tour. Adventurous families, couples, and groups will enjoy our half-day tours atop sand boards and in dune buggies hurtling at top speeds up, down, and over Peru’s massive sand dunes. 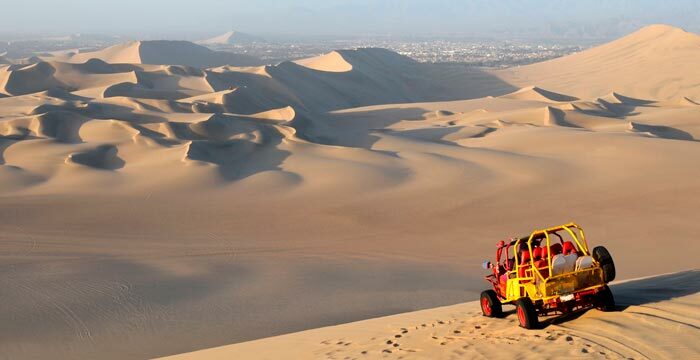 An ideal diversion for travelers staying in Trujillo, this adventure tour of the northern desert incorporates two exhilarating outdoor activities: dune buggying and sand boarding. After driving over the formidable dunes, you’ll get even more familiar with the landscape as you hurtle down an enormous hill on a sand board. This high-adrenaline escapade is suitable for both families on tour in Peru as well as grown-up couples and groups. 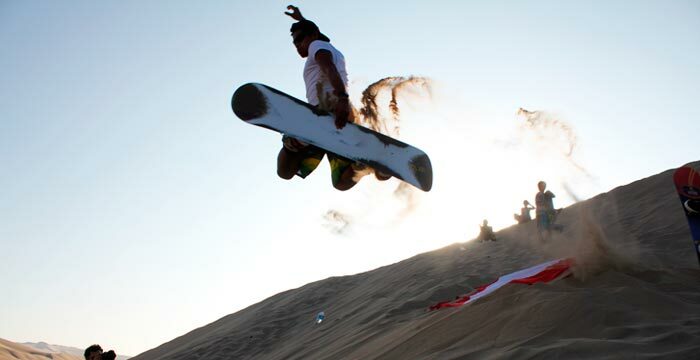 For the ultimate experience for sand boarding in Peru is in southern desert near Ica which offers up thrills aplenty. Once again, the fun starts in the dune buggy as you’re driven up and over the gigantic sand mounds. After, you’ll be brought to the top of a dune and given a sand board (like a snowboard but made for traversing sand), which you’ll then use to fling yourself down the slope. This fun-filled excursion can be arranged for families as well adult travelers, and can be easily arranged as a day trip from any of the main locales in the southern desert area of Peru.